Grotto Prophet Fez #7, Los Angeles Fraternal Supply Company Inc. 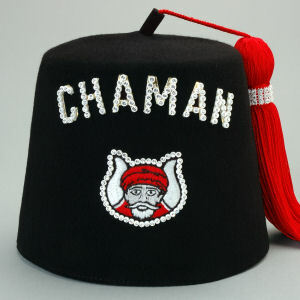 This Grotto Prophet fez is made of black felt and the Grotto name is hand jeweled with crystal rhinestones. The Mokanna patch in the center is outlined with crystal rhinestones The fez is finished with an 18-Inch Red tassel tac-sewn on the left (as worn) with a 3-row rhinestone band and a sweatband.